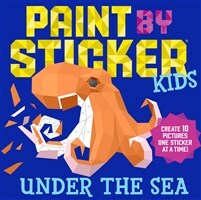 Designed for children ages 5 and up, Paint by Sticker Kids uses the same low-poly process to render and convert an image, but simplifies the process for younger artists. The templates are larger and divided into fewer spaces; the stickers are also larger, and more colorful. The result is magical, but just requires a little less dexterity (and time). New for this season is Under the Sea, a Paint by Sticker journey into the world beneath the waves. Kids will create a dolphin, a shark, an octopus, and other denizens of the watery world. The card stock pages are perforated so kids can remove them easily and display, or share, their finished works of art.